Katherine Delaney graduated from Vanderbilt University with a concentration in French and a minor in corporate strategy, all while competing as a nationally ranked Division l athlete on the track and cross country team. During her undergraduate studies, she had the opportunity to take several marketing courses and was intrigued with the field as a potential career choice. 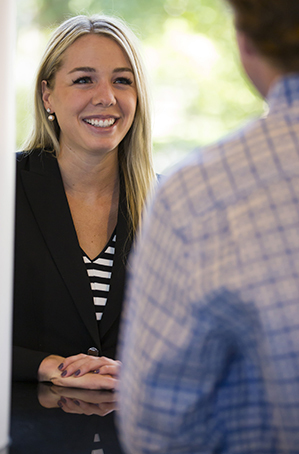 As a senior, she heard about the Vanderbilt Master of Marketing degree and discovered how the program could equip her with the additional knowledge, skills and experience she would need to thrive in marketing. Katherine describes what a typical Monday in the program is like as she balances classes, internship work and life in Nashville. I arrive for my Consumer Analysis class with Professor Kelly Haws at 9:40 AM. 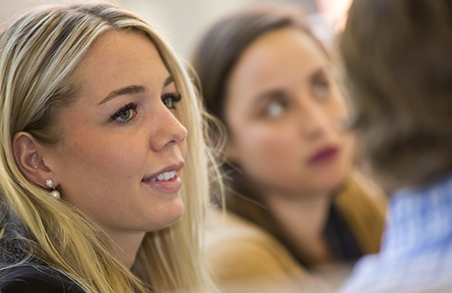 It is a core requirement for all Master of Marketing students during Mod 3. After class, I drive to M Street Entertainment Group for my internship and meet with my boss to go over the weekly agenda. My MBA peer and I report on our project progress, and we strategize for an hour about the tasks we need to complete moving forward. Throughout the week, I will work on my internship assignment, which typically includes sorting through data and recording key findings that M Street can utilize. I go home to my apartment and eat lunch while I get ahead on reading assignments and apply for jobs. Some days I use this time to meet with my CMC career advisor and second-year MBAs to discuss the job search process. On other days, I do social media work during this time for the Owen Graduate School of Management marketing team. I arrive at my last class of the day, Quantitative Consumer Analysis with Professor Jenny Escalas. After class on most Mondays, I have some flexibility in my schedule. On some Tuesday evenings, I attend Owen Student Government Association (OSGA) meetings as a Master of Marketing Senate representative. At this time on Thursdays, I go to Closing Bell at Owen to catch up with friends from the MBA, MSF, MAcc and MMark programs—this is a great way to unwind and have fun at the end of a busy week. After Closing Bell, we usually end up at Tavern in Midtown, Rebar or Tin Roof for some live music. On Monday nights, I arrive at Title Boxing for a good workout and then go home, make dinner and either do homework or watch a movie. Owen life is challenging and rewarding at the same time, and Nashville is a fantastic city that continues to impress me, even after five years of living here.